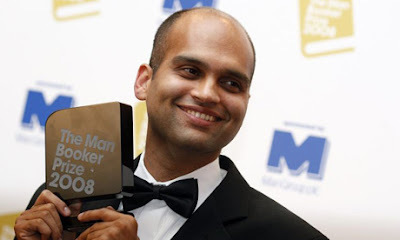 ARAVIND ADIGA was born in Madras, India, in 1974, but now lives in Bombay. He completed his schooling in India and Australia. He graduated from Columbia University in New York with a B.A. in English literature. After his B.A., he went on a scholarship from Columbia to Magdalen College, Oxford, where he received his M.Phil. in English literature. He went into journalism in 2000 through an internship at the Washington, D.C. bureau of the Financial Times. He worked as a financial correspondent in New York for two and a half years, covering investment and the stock market. In 2003, he returned to India as a correspondent for Time magazine. The Sunday Times of London called his first novel, The White Tiger, a “completely bald, angry, unadorned portrait of the country as seen from the bottom of the heap; there’s not a sniff of saffron or a swirl of sari anywhere.” The White Tiger was announced the winner of the 2008 Man Booker Prize for Fiction on October 14, 2008. He is the fourth Indian-born author to win the Booker Prize since it was launched in 1969, joining Kiran Desai, Arundhati Roy and Salman Rushdie. He is also the second youngest winner in the prize’s 40-year history. I’ve wanted to be a writer since I was in my teens, but it has taken me a long time to understand what kind of writer I’ve wanted to be, and what my subject matter ought to be. Was it difficult getting published? Did you experience difficulty in finding an agent and a publisher? The process of getting published has been long and difficult. My first book, a collection of short stories called “Between the Assassinations” was written in 2005—but still hasn’t been published. I’ve had the usual struggles to find and keep literary agents. I’d say it took me about ten years of serious work to get published. Only one person—a friend named Ramin Bahrani—believed in me and urged me never to give up, and so I dedicated the novel to him. The writers whom I admire are diverse, and range from R.K. Narayan to André Gide; but in writing The White Tiger I was thinking of a few African-American writers whom I respect very much: Ralph Ellison, author of Invisible Man, Richard Wright, author of Native Son, and James Baldwin, the essayist and novelist. Their narratives of the Black American experience formed a template with which I could explore the narratives of the repressed in modern India. How did you create the character of Balram Halwai? How much do you identify with him? The White Tiger was first written in 2005 as a third-person narrative, about a chauffeur in Delhi who kills his master, takes the money, and runs to Bangalore—where he eventually is caught by the police and goes to trial. In 2006, I rewrote it in the first person: and without any conscious intent on the author’s part, the ending of the book changed. The character of Balram Halwai is a composite of many men I’ve met and talked to, at train stations, liquor shops and bus stands during my travels in India. He is not in the least anyone I identify with; it was a conscious effort on my part to try and create a voice, and a character, whose views are entirely different from mine. Literature has to allow us to break down class and psychological boundaries, and enter into new and even disturbing states of consciousness; it has to expose us to moral standards and values that are diametrically opposed to our own, and force us to re-examine our own values. I’m amazed that so many readers and reviewers assume that Balram’s opinions are my own; so many of the writers I admire—Robert Browning, Vladimir Nabokov and Mark Twain—consistently experiment with narrative voices that are not their own. I grew up in a provincial Indian town, and I read what was available in its public libraries—which reflected the reading tastes of Britain a decade or two earlier: lots of adventure and detective novels, and some classics, like Treasure Island and Kidnapped. Later on, when I was in high school, I began reading English literature in earnest, and many of the writers I studied then have stayed with me: the poets Robert Browning and William Wordsworth, and the American novelist Mark Twain. The White Tiger has been called a novel that explores the real India. What do you think? The White Tiger is the story of a man’s quest for freedom—and of the terrible cost of that freedom. Balram Halwai, the protagonist, is a member of the invisible Indian underclass—one of the millions of poor Indians who have been bypassed by the economic boom. The novel attempts to give a literary voice to those who are being written out of the narratives of our time—the poor. The White Tiger is a work of fiction, written in the voice of a man who is both a victim and an aggressor; a man who is both sensitive and violent, aesthetic and deranged. It is meant to be a provocation; it is meant to jar and disrupt and entertain its readers—it is not an objective commentary on India today. I’d like for the readers to think about what Balram is saying about Indian society, but to remember too that the novel maintains an ironic distance from his views. Who are some of your favourite Indian authors? And why? When I get depressed, which is often, I reach for Kiran Desai’s work, and read a page at random, and that inspires and cheers me up at once. What a talent she is! I’m just about to start reading Siddharth Dhanvant Shanghvi’s second novel, The Lost Flamingoes of Bombay [which was recently longlisted and shortlisted for the 2008 Man Asian Literary Prize]. I do honestly believe that he is one of the most talented young Indian novelists. I read a lot of nonfiction, and often find it more interesting than fiction. I’ve just finished reading To the Finland Station, Edmund Wilson’s classic narrative of the rise of Marxism, which has to be one of the best books I’ve ever read. I’m working on a new novel: I think I’m not far off completion—but who knows! ERIC FORBES is the senior book editor with a publisher in Kuala Lumpur. After reading economics for a degree, which he didn’t particularly enjoy but somehow endured, he had a succession of jobs before joining the publishing industry. He has been in bookselling and publishing for over 20 years now. He can’t imagine doing anything else.